Now that Mia is 6 months old and becoming a bit more interested in toys and such I've been getting out some of the baby toys that we had packed away. This included Harry's sets of stacking cups, and I was reminded once again what a truly fantastic toy they are. They are so great that I decided to write a blog post in case anyone was looking for a simple, classic Christmas present for a baby or toddler. Our main set was from Early Learning Centre, a snip at £6 (although I'm not sure about the colours of their current set, I think that ours are nicer). We also have a set from Ikea which were a true bargain, although don't currently seem to be available. The Ikea cups are good because each one has holes in a different place, brilliant for in the bath. 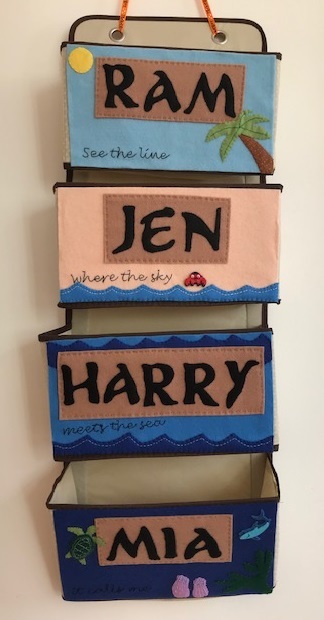 I've seen them in lots of other places too, you can gets one in different shapes, wooden ones, ones with different numbers, different pictures - there are lots of variations! Although I had packed them away as Harry moved on to other toys, he jumped on them when he saw them and has hardly stopped playing with them since they resurfaced. Now he is able to build them up into a tall tower by himself (he insists it is a lighthouse) and we had a fab time playing "Harry monster" where I built a tower and he marched over roaring and destroyed it. In their time they have been in the sandpit, the bath, the activity table and chased about the floor. They have been filled with rice, pasta, sand, cars and sponges. I even used to carry the smallest two about with me in the change bag for a toy on the go. It doesn't even matter if you buy a set for someone that already has them, as you can have lots of sets and they will still be played with! Buy a value pack of dried pasta to go with them and you are sorted. I agree that these are the best toy ever. So many things you can do with them! Lovely collection you have as we all know that kids love their toys most and if education is involved in playing then what can be better then this.